Collecting custom inventory data has 2 main parts. First enabling the custom classes using .MOF file then creating a custom SQL report to collect the information from SQL table views. Enabling custom classes has 2 tasks. 1/ creating an actual configuration.mpf file, 2/ creating a inventory class mof file. First identify the registry keys what needs to be inventoried and what information we need to capture. Then use RegKeyToMof utility to get the registry keys. On the bottom of the RegKeyToMof tool, you have options to use the version of SCCM you are using and options to change in between configuration.mof and class mof file. Now we have SOEConfig.mof and classes.mof file created with the inventory information. We need to import the new inventory classes into Config Manager by importing the mof files. First we will import the custom classes to client settings. 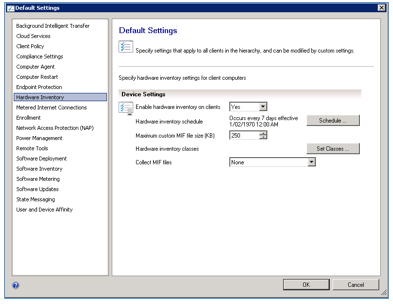 Launch SCCM Console then go to Administration, then choose Client Settings. On the right panel choose Default client settings then open properties. 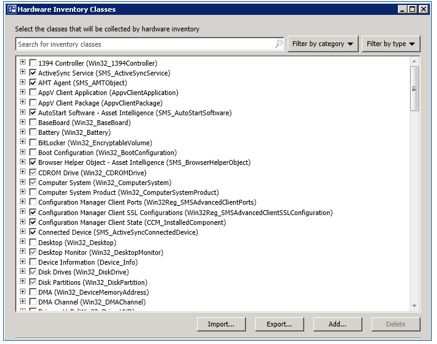 Choose Hardware Inventory then select Set Classes. Use Import tab to import newly created .MOF file. Choose Import both hardware inventory classes and hardware inventory class settings then click on import. Once it completes importing click OK and OK again. 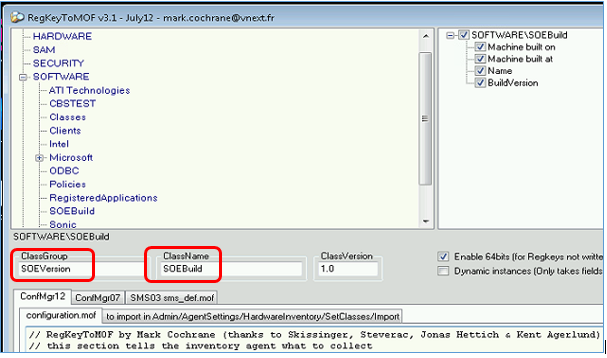 To check whether the import is successful or not Open the Client Settings properties then click on Hardware Inventory on the left side then click on Set Classes. So far we have successfully completed importing hardware classes. That’s it. The custom classes are imported and inventory is enabled. A new custom table will be enabled in the database to store the information. To view all the available table views in your Config Manager Database create a custom report using this Query. Now create a SCCM custom report to get the SOEBuild version details. That’s it. Give enough time to finish the inventory (By default the hardware inventory is set run every 7 days). Then run the report. It will give the Machine name, Machine Built On, Machine Built at and Build Version.